Musclepharm Combat 100% Whey Protein is one of our favorite protein powders, that’s why we gave it a stellar 5/5 star rating. This protein powder is a great way to get some lean muscle mass and also potentially helps in your recovery and overall gym performance. It uses quality protein, which is 100% whey protein isolate and concentrate. With every scoop it has 25 grams of protein. Whey protein is quickly and easily digested in the body and gives you a nice spike in amino acids. It’s also verified to have the 25 grams of protein and also be free of any banned substances. You can also use it before or after your workout to either help fuel you up or act as a recovery drink. This protein tastes great and is super easy to mix up. It’s low in fat, carbs, sugar, and calories to help support lean muscle growth. As a perk, it’s also gluten free and doesn’t have any junk added like artificial dyes, colors, or fillers. It’s a really clean product, which I appreciate! I felt great the entire time while taking this protein powder and didn’t experience any negative side effects. It does contain milk and soy, though, so be careful if you’re sensitive or allergic. So overall, we think Musclepharm Combat 100% Whey Protein is a high quality protein powder and we gave it a perfect rating of 5/5 stars. It’s super easy to use Musclepharm Combat 100% Whey Protein. It doesn’t take long at all to mix it up into a really nice protein shake. Just mix 1 scoop of protein with 8-12 fl. oz. of cold water or your choice of beverage. I really like it because it doesn’t have a gritty taste and there are no chunks after you blend it. I got this protein powder in the Chocolate Milk flavor. In my opinion, it tastes really good! Especially compared to many other protein powders, which leave much to be desired. If you like chocolate, you’ll definitely like this flavor. It’s sweet but not overwhelming and acts as a nice treat before or after your workout. As for the macros, this protein powder has 25 grams of protein, 1.5 grams of fat, and 3 grams of carbs per serving. 25 grams of protein is a great amount to help aid in performance, build muscle, and help with muscle recovery. For 1 serving (which is 1 scoop), it has 130 calories. Since this product is low in fat, carbs, calories, and sugar, it really helps if you want lean muscle growth. Musclepharm Combat 100% Whey Protein has a solid ingredient profile. It contains 100% premium whey protein in the forms of Whey Protein Isolate and Whey Protein Concentrate. Whey protein is digested very quickly in the body, so it offers up a nice spike of amino acids. 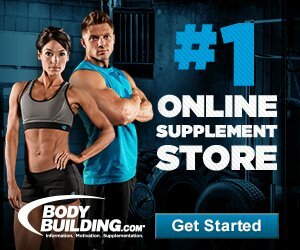 The ingredients used help support lean muscle growth and replenish nutrients after strenuous workouts that could aid in muscle recovery, as well. Every batch of Combat 100% Whey Protein is also tested and verified to be free of banned substances and have 25 grams of protein. It’s also low in fat, sugars, and carbs. This protein powder is also super clean and doesn’t contain any artificial dyes, fillers, or colors. It’s also gluten free, which is a definite perk for many people. This protein powder contains milk and soy (lecithin), so steer clear of this one if you’re allergic to any of those. I didn’t experience any negative side effects when taking Musclepharm Combat 100% Whey Protein. I was really happy about this and felt really good the whole time. It’s nice to have a protein powder that does its job without making you feel bloated. It does contain milk and soy (lecithin), so just be cautious if you’re allergic or sensitive to those. The artificial sweetener used is sucralose, which may cause a little belly pain or bloating in certain people. After testing out this protein powder, we think it’s best suited for those looking to build and maintain lean muscle mass. It has 25 grams of protein, which is a solid amount along for aiding in growth, recovery, and overall performance. You can take this protein powder any time of day such as before or after a workout, to help fuel or recover your body. 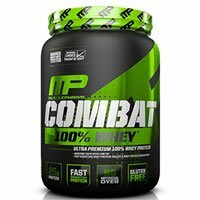 It costs $34.99 for a 2-pound container of Musclepharm Combat 100% Whey Protein. When you break it down, it works out to be 5.18 cents per gram of protein. That’s incredibly affordable and even a bit less expensive than average. I think it’s a great value for your money and could be a great tool for helping you reach your personal goals. I’m really excited to see that Musclepharm offers their customers a satisfaction guarantee. If you aren’t completely happy with your product, you have 30 days to return it for a full refund. Kudos to companies that stand behind their products! To buy Musclepharm Combat 100% Whey Protein, click here.